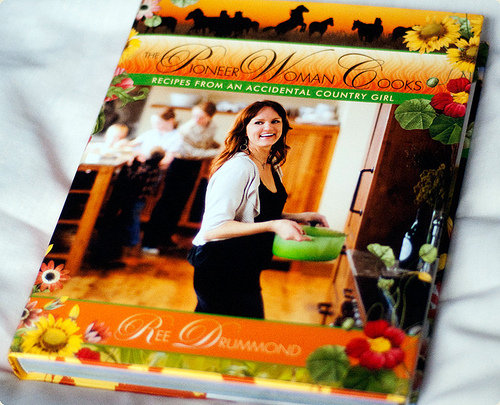 Back in 2009 my Dad showed me an article in Southern Living about The Pioneer Woman (PW). He was thinking about making her brisket recipe, as well as a mushroom one. Dad wanted me to specifically look at the mushroom recipe and tell him what I thought about it. Well, Daddy, anything cooked for four hours in a bottle of wine and a stick of butter must be good! A few weeks later he cooked the meal and it was delicious. The mushrooms were melt-in-your-mouth-wonderful. My issue of the magazine eventually made its way to the house and I sat down to read the article on PW and looked at all her recipes. I then somehow or another discovered her website. I do not recall if it was in the article or what, but I stumbled onto it; and from the moment I began reading, I was hooked. Not only can this woman cook, but she was entertaining and funny in her blog. I then looked at her photographs and hilarious captions, and well….I was hooked all the more! Ever since, I have been reading her blog along with a million or so other folks. Really. Not kidding. She has a BUNCH of readers! A year or so ago, I think or maybe two, she came out with a cookbook. Just look at the cover--beautiful! I knew the pictures in it would be lovely and so I decided to get it. However, life got in the way and I forgot all about buying it! I know -- how can a true fan forget about purchasing the cookbook? Well, I did go to get it once, and they were all sold out and then I just never got around to going back. I have a child. A boy child. I work. Life gets a little crazy at times. Fun crazy, but crazy. And besides, she posted recipes on her website all the time, so it's not like I was totally without any PW cooking! Anyway, this past Christmas my Dad gave me PW's cookbook! How fitting, the fella that got me hooked on The Pioneer Woman gave me her cookbook. This cookbook was so beautiful, funny, and full of yummy recipes. I actually sat down one day and read it cover to cover like a regular book. When she posted on her website that she was coming to my part of town, I knew I was going! I had to meet her. I had to have her sign my cookbook. I HAD to have her sign her name right across the mushroom recipe that had brought me to her. More to come! Up Next…..Do NOT do anything stupid.